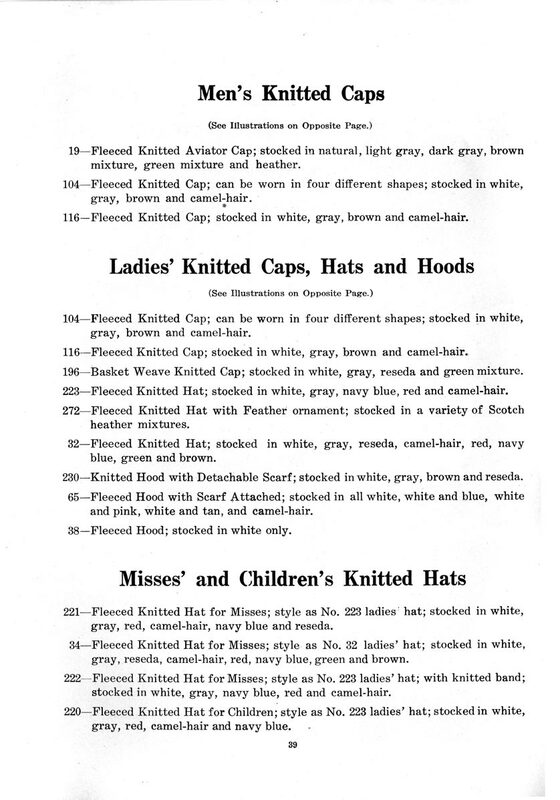 Decidedly unglamorous (although there’s a hint of style in some of the caps pictured), Dr. Gustav Jaeger believed in the power of wool for practical clothing. (He also believed in “Lust Compounds” which were later rediscovered as pheromones; and was also a etymologist specializing in beetles.) Three businessmen licensed his name to create “Dr. 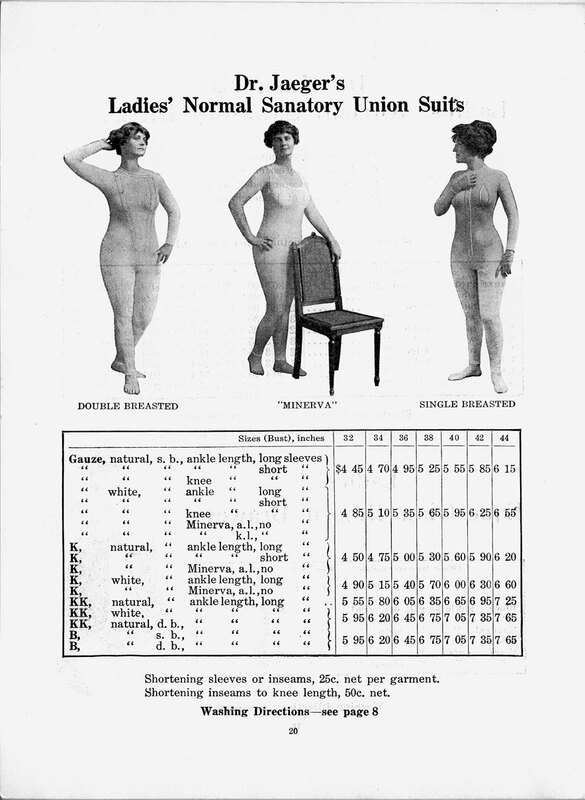 Jaeger’s Sanitary Woolen System” in the late 1800s. Dr Jaeger’s bona-fides were serious: his woolen fabrics were there when H. M. Stanley went exploring, and when Shackleton took his expedition to the South Pole. Clearly a Jaeger woolen cap was a wise investment, and a Jaeger wooolen union suit would keep you cozy and warm. 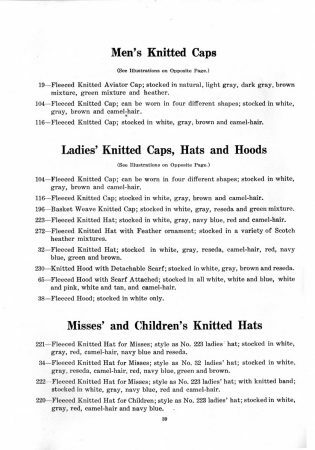 The catalog also sold blankets, socks, sleeping bags and anything that and explorer could use as long as it was made out of wool. Such things were Jaeger’s focus in the early days (although in 1913, the company was actually entering its 34th year.) 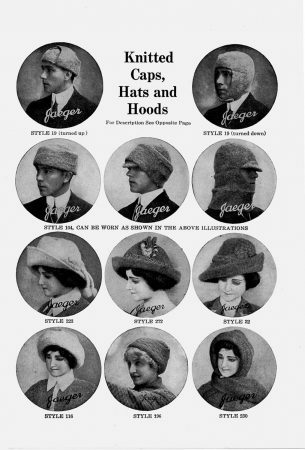 But then after World War One, the company discovered high fashion. It shortened its name to simply “Jaeger”, became a major British fashion retailer, and practically invented the camel hair coat along the way. Keeping up with changing fashion is a challenge though, and although the Jaeger company survives even now, it is currently in receivership. Too many linen skirts, not enough woolen underwear? Proves you should stick to your knitting.